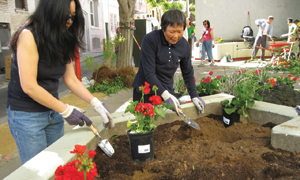 Pennsylvania Garden is located at 251 Pennsylvania Avenue at 18th Street in the Potrero Hill neighborhood of San Francisco, California. Neighbors have worked to clean up and beautify the Mariposa Street off ramp which lets onto Pennsylvania Avenue, and which is owned by Caltrans. The plants are nearly all native species, or drought tolerant when established, so the garden won't need to be watered much. Read the full story of the birth and development of the garden at the Pennsylvania Garden website. "Many hands make light work." This adage is so true - you should see what a difference it makes to the garden to have a team working away for just 2 hours on a Saturday morning. If you'd like to volunteer on the first Saturday of each month starting at 10am, please fill out our form below and let us know what garden, or non-garden help you might enjoy.